On September 19th, 2014 long-time pastor, author and television host, Gary Stearman, and his long-time friend, Bob Ulrich—along with their wives, Doris and Krissie, launched the Prophecy Watchers ministry. It was a step of faith into the unknown. Trusting the Lord to bless our commitment to Bible prophecy and having a deep commitment to real integrity and transparency in ministry, we began with few assets, but with boundless enthusiasm to serve the Lord and spread the message of fulfilled prophecy through this ministry—His ministry. Almost 5 years later we look back with incredulity at this bold decision. What were we thinking? We launched Prophecy Watchers with little in the way of assets. No mailing list. No email list. No building. No TV studio. No studio TV cameras. No lights. No furniture. No inventory. No computers. And no employees other than the original four founders. But “Four is Enough” when the Lord is in the midst. In spite of our limited outreach, people searched for Gary online and they found him at ProphecyWatchers.com! Only in the age of the Internet and Social Media could we have reached so many people in so little time. Today, we find ourselves humbled by the tens of thousands of generous donations we have received from so many excited people and by the doors the Lord has opened. As the old saying goes, “It’s good to have friends.” Even better, as the Psalmist said, “It’s better to put your trust in the Lord than to trust in men.” We continue to trust the Lord to build this ministry, HIS ministry, and to lead us in the direction He would have us go. Gary and I want to say a big THANK YOU for your role in helping us get so far, so fast. We were able, with the Lord’s leading, to return to network television in record time—proclaiming the good news that Jesus is coming soon! We’ve added an e-mail newsletter, a monthly magazine—The Prophecy Watcher—multiple prophecy conferences, our own ROKU Channel and the Prophecy Watchers App. But the best is yet to come. The Lord has placed His hands upon this ministry and blessed us far more than we could ever ask or think. And each of YOU have helped Him accomplish His purpose. We are so very appreciative of your amazing support and encouragement. 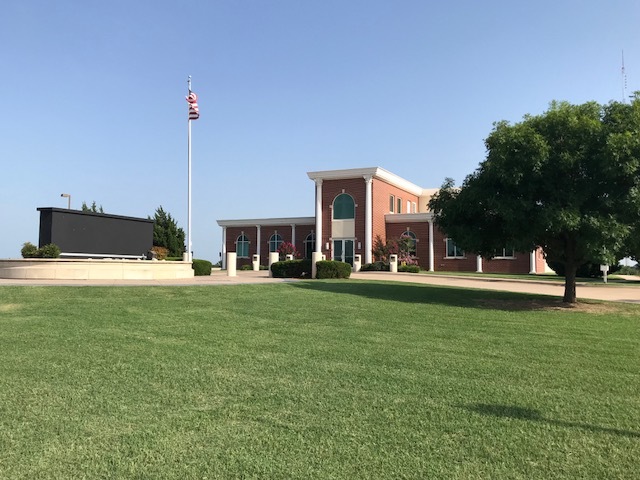 In January of 2019, Lord willing, we expect to move into a new building, the former Oklahoma City headquarters of the Trinity Broadcasting Network (TBN). In a totally unexpected miracle, God has opened yet another door to help us take this ministry’s outreach to a whole new level. Our new headquarters sits on several acres of isolated, out-in-the-country real estate. The building consists of 13,250 square feet, with 4,000 SF dedicated to a soundproof TV and radio studio. It solves our ongoing noise issues, gives us massive space for our ever-expanding ministry bookstore, solves our parking problem and allows us the privilege of having a professional video production studio for the very first time. Gary will even have his own office, another first! We can’t wait to move in and begin the exciting transition. The big empty sign out front is about to get a new name! Should you care to make a tax-deductible donation to Prophecy Watchers, you can use this link to make a donation of any amount. If you want your donation to be part of our new Building Fund, here is a link with a series of options and some special gifts we’re sending out to thank you for your generosity. Thanks so much for supporting this ministry.